I'm a creative person and I love finding crafts and activities to do with my toddlers. 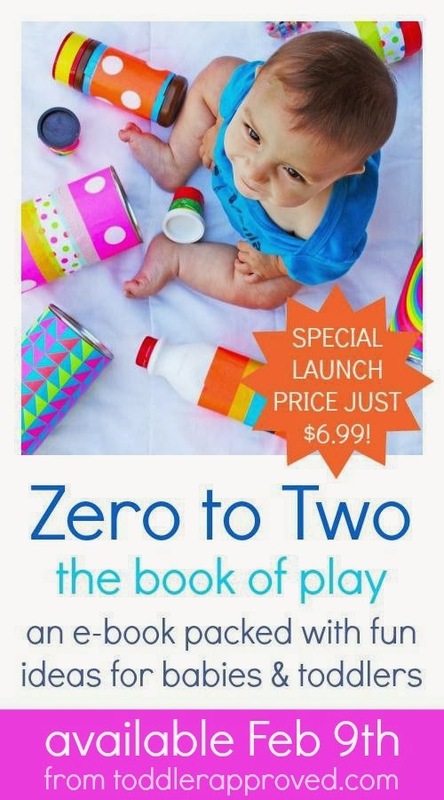 I started this blog over 2 years ago when my son was a toddler and it has morphed into a blog that shares crafts, activities, and learning ideas for kids ages 0-6 since EJ and I have kids ranging from 20 months to almost age 6. To be honest, crafting with preschoolers is easier for me now in a lot of ways. They are more predictable and have longer attention spans... but I absolutely love it when I find something my toddler adores and has fun doing with me. 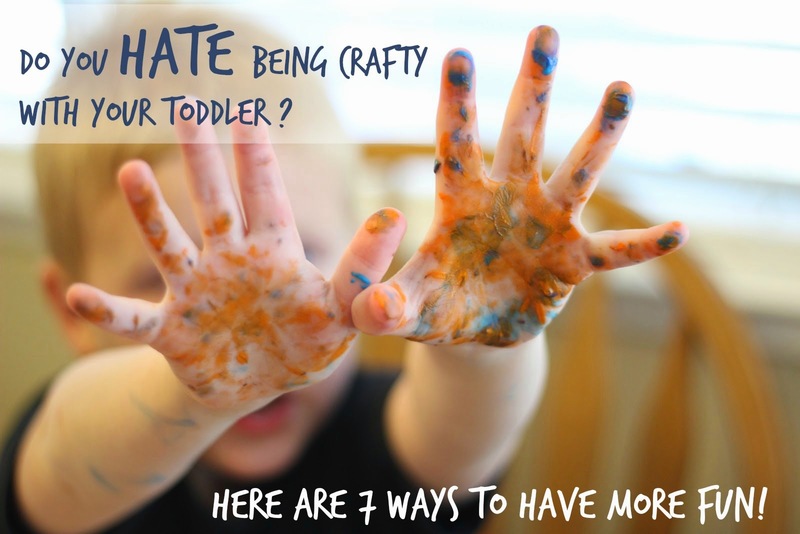 Over the past several years of crafting with large and small groups of toddlers I have learned a few things. If I have to look for stickers or print something off or cut something while my toddler is creating with me I can lose her attention quickly. 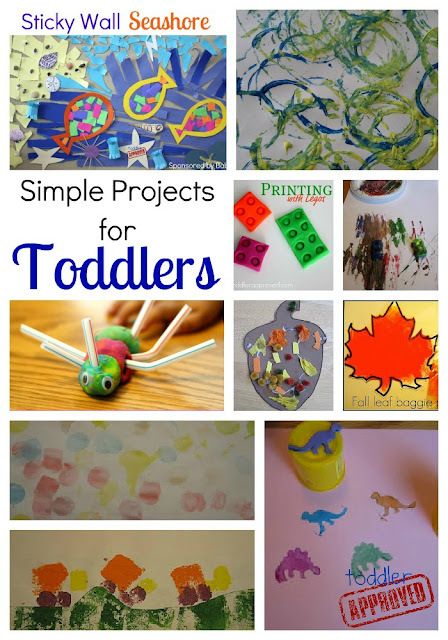 My favorite crafts & activities for toddlers (that I'll share below) include very little materials and not much preparation. If I am crafting with toddlers I always prep everything ahead of time and try and have it close by and easily accessible (but out of reach of little fingers until they need it). I don't mind a little mess but I know several moms who dislike messy art projects. If you are worried about clothes or furniture, use smocks (or strip your kids down to their diapers like I do) and create outside or in an area of your house that can get messy. I love to have my toddler do projects while sitting in her high chair because she pays attention a lot longer and the mess stays contained. Being stressed out while crafting is not ideal... so if an activity is too messy for you, do one that is more your style. Your toddler will appreciate any chance to create and connect with you. This is hard. I like to have something "fridge worthy" but without a doubt the process centered activities I do with my kids are always way more fun... and they are always fridge worthy because they are beautiful reminders of fun we've had together. Their paper plate dog might look like a volcano... but at least it is their volcano and not something I basically did for them. I love this post by Debbie Clement at PreK + K Sharing that discusses why process art is so important for kids. Forcing your child to do a craft project isn't going to create lasting positive memories. Making your child "finish" a project also doesn't yield great results. If I come up with a toddler craft idea I like to set out materials that look inviting, invite my daughter to join me, and then I just get started creating. I often set up our projects on the kitchen floor because they are easily accessible. She will then join me for a bit, then sometimes get distracted with something else, and then come back and create with me some more. Keeping the activity open ended and simple works well for us and keeps her coming back. Toddlers love repetition. Right now my daughter wants every project to involve stickers... so I've been trying to come up with creative ways to use them. She also loves printing on paper using paint and different tools. Instead of trying to change it up and get her to try new mediums or ideas, we just find new things to dip into paint. The process is basically the same, but the materials are a little different. She loves it and as she explores the same medium again and again she is getting more creative with what she does. It is tempting to finish projects for kids or add a few extra details to make a project more cute. I have been guilty of doing that a few times. Now I just do my own project right next to my daughter so that I get my creativity out and am not tempted to fix or add to her art. By adding to or finishing my daughter's art I am kind of acting like what she did wasn't good enough. I don't want her to feel that way ever! Let the guilt go. Don't feel the need to put other moms down for wanting to craft or create with their kids either. There is nothing wrong with them OR you. Every parent has a special thing that they like to do with their kids. Some are really good at reading together, some love being outdoors or doing sports, and some are really good at finding the perfect crafty art class for their kids to take. Whatever works for you is what you should do. Your child wants to spend time with you and it doesn't really matter how you spend that time as long as you both enjoy it! What is your toddler's favorite way to create right now? What do you love about creating with toddlers? What is hard for you? Thanks for this! Love all the pointers...sometimes crafting with toddlers can be hard. I've shared this all over the place. I had to learn to keep my hands off my son's work. You have hit the nail on the head with all of these suggestions! I am a toddler teacher and it has taken me a lot of trial and error to apply some of these "adult" rules to our classroom art experience. It makes a world of difference in the children. Anyone new to the game would greatly benefit from this post and I can't wait to share it with my teacher friends! Thanks for taking a moment to comment Rachael. Some of these I have had to relearn again and again as I have more kids and forget. I admire toddler teachers!! Thanks for sharing. What are the 6 activities being done in the picture on the top? 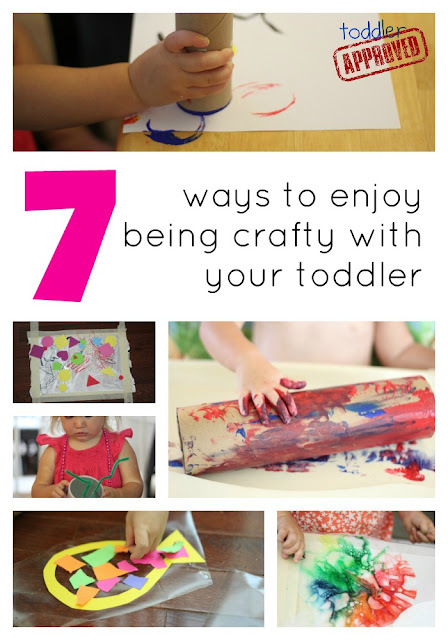 I am going to do some of these activities with my toddlers they are so colorful and age appropriate.